The best way to travel around South Korea (once you have made your way from Incheon to Seoul! ), is via the excellent, high-speed rail service. I travelled from Seoul- Gyeonggju- Busan via the KTX. 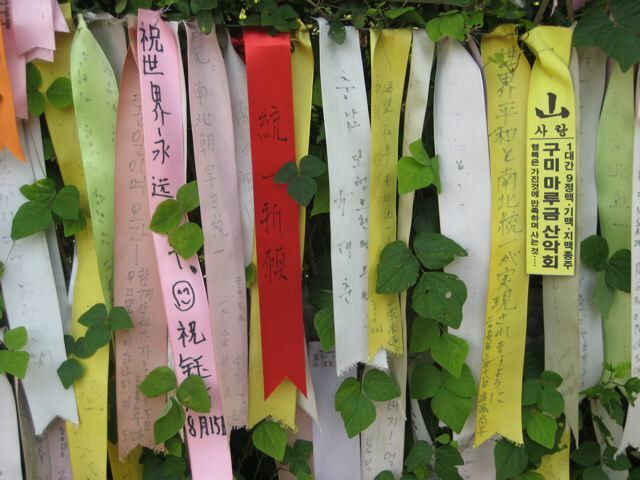 It is possible to spend more than a week in Seoul exploring the various areas. Myeong-dong is the main shopping centre and the most popular/ populous area. However I spent more time in Insa-dong which has more of traditional old fashioned atmosphere. Many nick- nacks can be purchased and its nice to just wander round. If you take the underground, the map will show pictures of the various attractions at each stop- very handy for tourists. Also, I found many people speak english in Seoul, and will often stop you in the street to speak to you, ask where you are from and to practice their english. Whilst in Seoul I also visited the Leeum, Samsung Museum of Modern Art in Hannam-dong. It has a nice mix of old and new separated out onto the different floors. 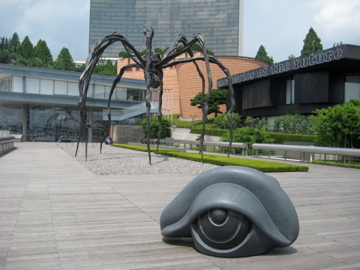 It also has a giant Louise Bourgeoise Spider outside. The building itself is also an interesting piece of architecture, with modern quirks and functions built into it, both inside and out. Seoul is surrounded by mountains. Wherever you are in this congested city, you can look out to the horizon and see the mountains. Lilly ponds are also everywhere. I stumbled upon this one whilst in a daze….summers in Seoul are VERY hot. I think if I ever return I will go in Spring. 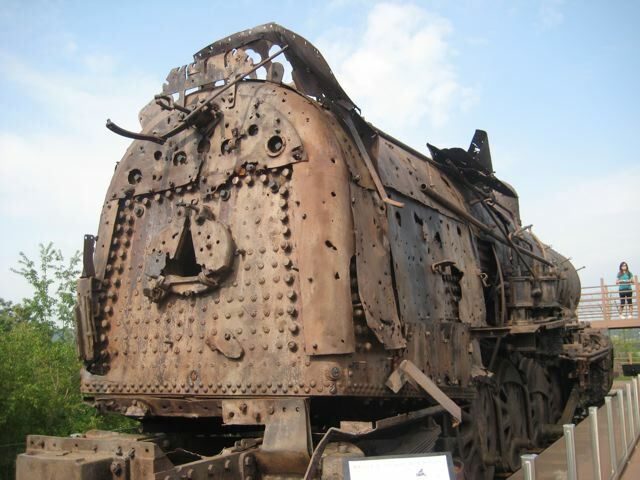 To get to Gyeongju take the KTX high speed train to Dongdaegu and transfer to the Saemaeul there. It takes about 3 hours plus transfer time. 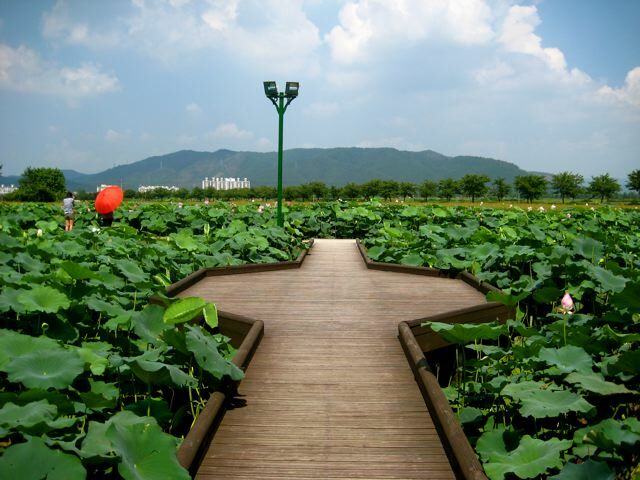 Gyeongju dates from the pre-historic period and is known as “the museum without walls”. It is packed full of more tombs, temples, rock carvings and pagodas, than any other place in South Korea. You can easily get to the laid- back port- town of Busan from Gyeongju by Bus. This is a very popular beach resort and gets packed during the summer months with Koreans filling up the whole length of the sea with yellow dinghi’s. The place has a very modern/ business-ey feel to it and there are many large international hotels. 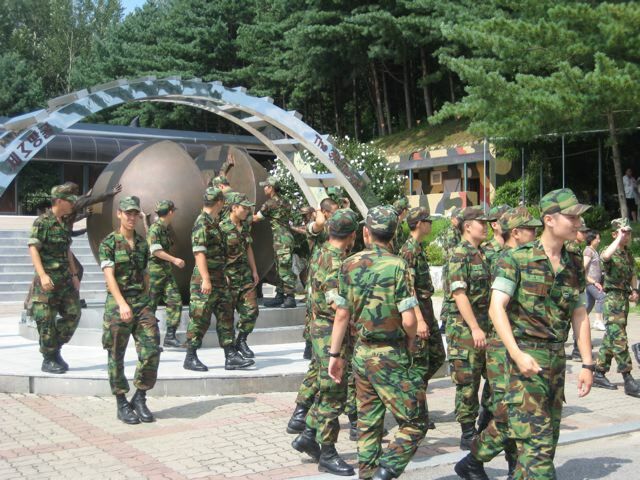 You get the impression that this is where South Koreans come to relax, when they are not working. Despite the foreign tourists giving off an air of endless Thai beach resort, you do not feel that relaxation is a way of life for South Koreans. Busan is also the jumping off point to Europe, America, and most frequently, Japan- the nearest point being Fukuoka on the northernmost extremity of Kyushu.